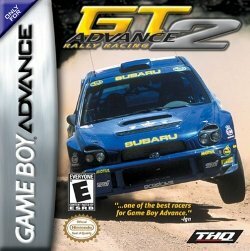 GT Advance 2: Rally Racing (known as Advance Rally in Japan) is a rally racing game developed by MTO and published by THQ for the Game Boy Advance. It was released in Japan on December 7, 2001, in Europe on June 28, 2002, and in North America on June 30, 2002. It is the sequel to GT Advance Championship Racing. GT Advance 2: Rally Racing is a racing game and the cars and environments hold true to a rally racing format. The game contains fifteen cars from Japanese companies such as Subaru, Suzuki, and Mitsubishi. Upgrades are not available for the cars, but it is possible to fine-tune them to fit personal preference. This page was last edited on 30 May 2009, at 22:55.